Mission style furniture is characterized by rectangular shapes, 90 degree angles, and straight vertical and horizontal lines. First conceived in the Arts & Crafts period at the turn of the 19th century, mission and craftsman style furniture has maintained popularity in traditional and arts & crafts design circles ever since. 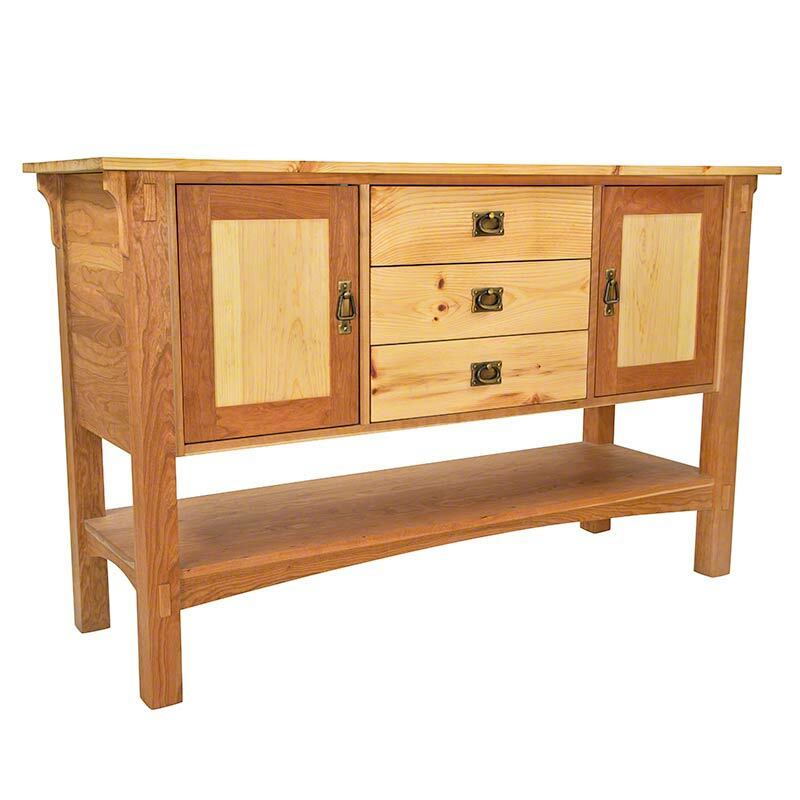 Mission style furniture is often described as sturdy, heavy, and even chunky. It’s characterized by straight vertical and horizontal lines, square or rectangular legs and spindles, and durable construction. Mission style furniture represents the ideals of simplicity of design, integrity of construction, and truth to the materials. Joints are often exposed and the natural characteristics of the wood are emphasized with flat panelling and finishes that accentuate the grain. The exposed joints and highlighted grain patterns are often complimented with metal loop drawer pulls and hinges. Traditionally, mission style furniture has often been built with red or white oak wood (often quarter-sawn), although other woods like cherry, maple, walnut, and ash have been used more commonly in mission furniture over the last several decades. The term “mission style furniture” was first coined by New England furniture craftsman Joseph McHugh. McHugh built a collection of stylistically similar furniture based on inspiration from a chair he discovered in a church in San Francisco, CA in the 1890s. The word mission is an ode to the spanish missionaries who settled in Northern California during those times, although the design inspiration for mission furniture has little to do with the religious Spanish missionaries and their culture. Moreso, mission style furniture was a counter-movement to the perceived excessive ornamentation of Victorian style furnishings that became popular in the mid- to late- 1800s. Around the same time, there was a sentiment that the industrial revolution of the early 1800s had caused us to devalue high-quality, handmade goods in favor of those that could be cheaply mass-produced. Mission furniture took hold between the years of 1900 and 1915 as a response to both of those movements. Mission furniture rose to prominence during the Arts & Crafts movement of the early 1900’s, also known as the American Craftsmen era. The movement brought with it an appreciation for high-quality, handmade goods and the people who made them. Because of this, the terms mission furniture, arts & crafts furniture, and craftsman furniture are forever linked and mostly interchangeable. One of the most influential mission style furniture craftsmen of the time was Gustav Stickley, although he loathed the term “mission furniture” in favor of “craftsman furniture.” Stickley operated a manufacturing facility in Pennsylvania, and his work has more or less defined the terms mission and craftsman style furniture. Mission furniture remained among the most popular furniture styles until the 1930’s, when it was succeeded by the art deco movement. It experienced a renaissance during the 80’s and remains popular today. Mission and shaker style furniture are often associated because both styles have been adopted by traditional furniture craftsmen. The Amish are often cited as the source of both design philosophies, although that’s not true in either case. Whereas mission style furniture was birthed into existence by Joseph McHugh and furthered by Stickley, shaker style furniture originated from the Shaking Quakers in the late 1700’s and early 1800’s. It wasn’t for another few decades that mission style furniture began to emerge. Both styles originated in New England. When built by master craftsmen like the ones we work with at Vermont Woods Studios, both shaker and mission style furniture are built to last for generations. All of the wood furniture at Vermont Woods Studios is handcrafted in Vermont and guaranteed for life. Our craftspeople have several variations on original Mission style. For those looking for traditional mission furniture, our American Mission collection may be just what you're looking for. For a modern twist on mission design, check out our Contemporary Craftsman and Cherry Moon collections. You can also see the design features of mission style furniture in some of our outdoor furniture collections. Our all-weather recycled HDPE plastic outdoor furniture is 100% american made and lasts forever! What's Different About Vermont Woods Studios? As wood furniture makers, we're passionate about forest conservation. All our hardwoods are locally sourced and sustainably harvested, and we plant 2 trees for every order. Join us in Furnishing a Greener World. Dining Furniture Designs: Which Style is Right for You?